Women's alcoholism is more dangerous than the male. If a man drinks, it is considered that he needs help. The woman in this case is obstructed. So the girls hide their addiction until the last moment, when it required a serious and long-term treatment. Also the danger of female alcoholism is that it develops much faster than men. If at first the woman could still quite easily give up alcohol, then gradually this dependence increases exponentially. To begin to heal from alcoholism, you need to contact the psychiatrist. And it is the most difficult step. Very few women voluntarily seeks treatment. First, the recognition of problems may lead to public criticism and misunderstanding. Second, many girls don't realize that they suffer from alcoholism, as drinking alcoholic beverages believe that they are harmless and do not cause addiction. Therefore, if you notice that your wife, mother or sister too much to drink, do not swear, condemn not, and it is better to take her to a good drug treatment clinic, where she will be able to help in the fight against the "green snake". The treatment of the disease should be comprehensive. It is necessary to eliminate the effects that alcohol has done to the female body. This is usually used pharmacotherapy. This eliminates the damage caused to the kidneys, liver, heart, and nervous system. The body is cleared from toxins and other harmful substances with alcohol. The stronger the drink lady, the longer and more serious the treatment will be, as under the influence of large doses of alcohol, the female body is destroyed faster. In the treatment of alcoholism in women is very important to establish a conscious resistance to the desire to drink. This will help psychotherapy. 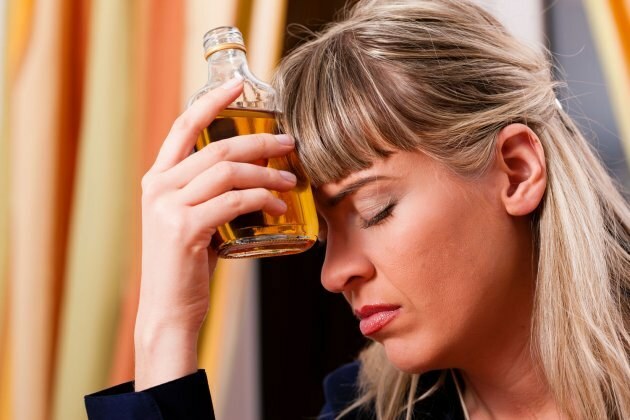 During the sessions, an experienced doctor can identify the problems that led to alcoholism, as well as convince the woman that the use of alcohol not only will not solve existing problems but may create new, and will also help to consciously abandon the use of intoxicating beverages. Treatment at this stage can be very long, as not immediately see any noticeable results. And many women, seeing such inefficiency, stop fighting with the addiction. At this point it is important to have a number of people that would have supported her, was persuaded to continue treatment. Women being more emotional and sensitive than men. Therefore, an important moment in the fight against alcohol addiction is the presence of close friends and relatives who always support, take care of her. And this attitude should be not only during treatment but also after it. If a woman feels she is alone again, she didn't have with whom to discuss their problems, it can again resort to alcohol for solace. Then all treatment will be in vain. It is not necessary to resort to using different character sets and other similar techniques. Their action is due to the fact that in humans is the fear that something can happen if he drinks. But a conscious rejection of alcohol does not occur. Gradually the fear will pass and the woman again begins to abuse alcohol, perhaps even in greater quantities than before. To cure female alcoholism, need optimistic. How would drinking women did not want to look cheerful, under the influence of alcohol in fact it is the most unhappy person, who is devoid of feelings, which may experience other normal woman. There are different causes of alcoholism in women, they need to try to instill a small portion of optimism. However, alcoholism affects equally men and women, what, then, is due to going to the people known myth that female alcoholism cannot be cured, in contrast to the alcoholism of the male? Such cure female alcoholism is more difficult for the reason that it is often the woman herself does not want to change anything in your life, fight with his disease, to try to eliminate addiction and try again to live a full life. There are many different diseases that are either treated or remain in the human body for life. One of the most dangerous diseases considered to be female alcoholism. Russia is famous all over the planet, their consumption of alcohol, and is very quickly gaining momentum. And that's too bad, since starting to drink in Russia alcohol-containing drinks since childhood. Some parents even do not mind their children drinking alcohol. It is one thing when such products are used for men and the other for when it accepted women. There is nothing worse than a female drunk. Some men are able to stop in time, but women did not, and because of this, problems begin. And from such problems, therefore, girls start drinking even more. At such moments, she simply forgets about everything: family, work, career and even about yourself. Often after a long binge of women go into deep depression, and it can even cause the consequences, such as suicide. But women's alcohol misuse can be eliminated. After all, alcoholism is not a diagnosis or a terminal illness. This is only a temporary weakness, which, as it seems women and men alcoholics can recover with the help of spirits. But to cure women's binge drinking, it takes a lot of time and effort both patient and doctor. Most importantly, neither the woman nor the man will not leave to drink alcohol, yet they do not want to, because forced treatment is stronger than injure the psyche of an alcoholic or alcoholic. But this does not mean that if she does not agree with or any help to stop drinking, don't have to deal with this. No. Just have her in every way as if to hint that she needs to stop or something. Even try to take responsibility and follow each step of a person suffering from alcoholism. And the most important thing to remember when treating, no need to traumatize the woman by some dreadful news, for example, the news that someone died or got very sick. The bad news it can even more to binge, and even then it's unlikely it will turn out to stop her. Where it is possible to treat people who abuse alcohol? Many believe that the treatment can produce different sage or fortune-tellers, but this is misleading. It will not help and you will lose extra money. It is best to try to go to the clinic, but in any case not in the cheap and with a bad reputation, as it will also allow the patient to think about what it is useless. In General, to treat alcoholism must necessarily and in every age, as if time does not stop the alcoholic, the more likely he or she will not live long.